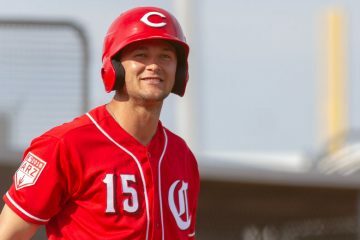 Nick Senzel, the Cincinnati Reds top prospect, missed the second half of the 2018 season. His year began in Triple-A Louisville. And it began with him playing second base, a position that was new to him as a professional. But, he did spend some time there, albeit a bit limited, while he was in college at Tennessee. The move went well. In fact, it went better than well. He was named as the International League’s best defensive second baseman. At the plate he did what he’s always done: raked. In 44 games he hit .310/.378/.509 for the Bats. If these words are to be believed, then it’s time for the Cincinnati Reds front office to do something drastic. That drastic thing? Print up 162 lineup cards for the 2019 season with Nick Senzel’s name already on them, hitting somewhere between 1st and 3rd in the lineup, with the letters CF next to his name. On Tuesday I wrote about the options that the Reds had with regards to Billy Hamilton and Scooter Gennett and the raises they were due in arbitration. In that article I wrote that it may make sense to trade Scooter Gennett and slide Nick Senzel in at second base. That would free up about $10.5M to spend elsewhere on the team. I also suggested attempting to move Hamilton in trade or possibly non-tendering him and saving another $6M. Again, if the words of Shawn Pender are to be believed about Nick Senzel, this opens up other possibilities. One of those would be to start Senzel in center field and keep Scooter Gennett at second base. That won’t free up as much money. But, it would drastically improve the offense and probably put them as one of the better teams in the league. With Senzel in center, looking around the field, the only two guys in the every day eight that might be considered below-average hitters would be Jose Peraza and Tucker Barnhart. There would still be plenty of work to do for the Reds in order to get to the point where they were competitive. But replacing Billy Hamilton in the lineup with Nick Senzel would be a massive boost offensively. It would also free up about $5.5M in salary that could be added to whatever it was that they were going to add to the 2018 payroll. That money could be used to either sign free agent pitching, or take on salary for pitching in a trade. If the Reds believe Senzel can actually play center field, this is an easy decision to make. About 12 hours after I posted this article news broke that Nick Senzel would require surgery to have bone spurs removed in his elbow. Bobby Nightengale of the Cincinnati Enquirer had this one first. Aside from not being able to play in the Arizona Fall League because of it, this doesn’t look to set back anything. He’s expected to be ready by spring training, and really should only keep him off of the baseball field for a few weeks during the offseason. Doug Gray is the owner and operator of this website and has been running it since 2006 in one variation or another. You can follow him on twitter @dougdirt24, contact him via email here or follow the site on Facebook. and Youtube. Peraza a below average hitter? 2.3 WAR 185 hits, 14 homers is below average? I guess the standard for average is rising. 97 OPS+ is slightly below-average. WAR is not a hitting stat. It’s an everything stat. It includes defense, positional adjustment, base running. So you judge on OPS alone? I guess we will have to disagree on him being below,average hitter. 184 hits clearly shows the ability to make successful contact and the 14 dingers probably more than most would expect. Could he walk more? Sure ut that alone does not make him below average. I’ll take OPS+ as a gauge for hitting over hits or home runs every day of the week and never think twice about it. One of those stats correlated incredibly highly with runs scored. The other two simply aren’t remotely close. They both miss way too much information about hitting. Yes, but for a SS, it is slightly above average. Overall, I would call JOSE a average hitter. So where does this put Johnathan India? So # of hits isn’t a good thing to look at when talking about a good hitter? Don’t overthink yourself on this one Doug. Peraza tied for 9th in baseball in hits. That’s good! Lol just because you prefer a fancier stat doesn’t change that fact. I don’t care if he led the world in hits. He’s a slightly below-average hitter. Hit total does not make one a good, or bad hitter. The value of their plate appearances does. What we know: OPS+ correlates very, very highly to actual runs scored. What we also know: hit totals do not. Neither does batting average. I promise you that no team in baseball is thinking: You know what, we don’t care about OPS, let’s look at the number of hits a guy has and determine who is the best hitters that way. They aren’t. Because we absolutely, without question, know better. I’m not overthinking this. You are very much underthinking it. Nowhere in my article did I say “below-average for their position” or “above-average for their position”. I said below-average hitters. And in 2018, both of them were that. And the context was there as to the entire lineup. Brennen & Simon, Jose Peraza had a good season. He was an average-ish hitter (as Doug described) who played all year at a premium position and often hit at the top of the lineup. He got a lot of plate appearances and played in almost all games. For a guy who many believed was just a utility bench player that’s a good season. Among SS with > 400 PA, he was 3rd in hits, 16th in HR, 10th in doubles, 21st in ISO, and 15th in wRC+. That’s an average hitting starting SS. And if he’s our 7th best hitter in 2019 (again as Doug stated) as a 25 year old with some speed who’s coming into his own on defense at a premium position, I’ll take it! Come on Doug. All judgements about player performance have context – even if it isn’t said. We don’t compare catchers’ stolen bases to center fielders. Jose Peraza had a good season in basically his 2nd full season. To suggest he is some sort of terrible weak link in the reds lineup is pretty disingenuous. Keep the focus on where we stink – starting pitching. Getting an extra +5 OPS out of our shortstop position is not going to change our record. Senzel, Winker, and Votto at the top of the order would mean a LOT of RBIs for whoever hits 4th and 5th. You still have to keep Senzel down for two weeks at the start of the season to “learn CF.” That extra year of control is way too valuable in his case. That lineup looks good to me. When the Reds face a LHSP, put Casali in the 5 hole and slide the others down one behind him. This puts our top OBP guys at the top of the lineup. I would like to see Senzel start in the middle of the lineup as he adjust to ML pitching. I also completely disagree with saying Peraza is a below average hitter… You want to call out his defense, his walk rate, ok fine… but that does not make him a below average hitter. No, none of that makes him a below-average hitter. His actual production at the plate is what makes him a below-average hitter. His OPS+ is 97. League average is 100. His wRC+ is 97. League average is 100. He’s a slightly below-average hitter. When I say hitter, I mean the entirety of what a guy does in the batters box. And the entirety of what Jose Peraza did in the batters box in the 2018 season was slightly below-average. I’m just not sure what else to say to you guys on this…. I’m not all that great with the new era stats but what was the league average ops+ and wRC+ for shortstops? Would it be better to say “below average offensive player” rather than hitter. Because the boy can hit, he just doesn’t walk enough in the modern world. That way everyone can agree. I actually think he is a work in progress and will improve in plate discipline like Suarez did. Among SS with > 400 PA, his 97 wRC+ was 15th out of 30 — the median number for that sample. He was an average hitting starting shortstop, which is fine! Peraza had a terrible June (45 ops+). From July through the end of the year he was: 122, 131, 105, 113. So the last 4 months of the season he was an above average hitter. Everyone has valid points. Doug is right he is a tick below average for the league, well above average for his position. If he becomes an average defender and maintains his current bat he is very valuable. I don’t know that I’d say he’s well above-average for his position. Above-average, sure. Well above-average probably means different things to different people, though. There’s not an easy way to sort through shortstops OPS+ on Baseball-Reference without the play index, which I do not have. But if we go to wRC+, which is very similar. Of the 21 players that qualified at Fangraphs listed as shortstops, Peraza ranked 12. The top 11 guys were all at 105 or higher. Peraza was at 97. If we push it down to 400 plate appearances you get 30 guys. Peraza ranks 15th. Shortstop is weird right now in the Majors. There’s a group of really good hitters at the position. The top 6 guys were all at 120+. The bottom 11 guys are also below 86, too. It’s kind of like the teams right now in baseball – you’re either really good, or you’re really bad. And there’s very little in the middle. Fair enough well above was a bit of push for some reason in my head i was thinking ops+ was around 85 for the position. At 90 it is just above average. Seems like Dilson, Dixon and Blandino can all approximate Gennett level production for a 20th of the cost. They all have shown the ability to OPS above .800 in the upper minors. They are all entering their prime. Dilson in particular has to stick on the roster and has not seen a full healthy season to perform well for the Reds. Let it happen. Name one of those 3 the starter. Move Hamilton and Gennett and replace them with internal rebuild results in Senzel and (my pick) Dilson. I think you are underestimating how good Scooter Gennett is. Dilson, Dixon and Blandino = Gennett? There is a zero percent chance that Dixon/Dilson/Blandino will get anywhere remotely close to what Gennett did offensively. Guess I would rather have the three and the pitcher Gennett money could buy. Would be less power hitting but better pitching and much better defense. Gennett was outstanding in 2018 and I don’t think you can make an argument that the 3 guys you mentioned, individually or collectively, would come anywhere close to Gennett’s 2018 production. The closer case is whether the team should invest longer term in Gennett. I think that would be a mistake particularly since the Reds have some excellent young players on the way such as Senzel, India and Long, who could play 2B. In the meantime, I would like to see what Herrera could do if given a chance to play regularly. One of the more frustrating aspects of the 2018 season was the way Herrera was handled. The other 2 guys seem more like bench players at the MLB level to me. Also, I can’t believe that there have been all of these posts made about Jose Peraza being called “perhaps a below-average hitter”, when, well, he absolutely was that in 2018, and no one has even said one thing about the fact that someone out in Arizona that works for the Cincinnati Reds in their front office said Nick Senzel can play center field. Go get yourselves some caffeine, guys. There are bigger fish to fry this morning than talking about Jose Peraza not quite being an average big league hitter in 2018. Given that he was pretty bad through May, then improved substantially, and given that he is still pretty young, I think it is reasonable to project that Peraza will be an above-average hitter next year. Maybe he won’t be. He ain’t George Brett or even Hal Morris as a hitter, but he’s a plausible major league shortstop. The fact that we can pretty much all agree on that now is a big improvement from where we were last year with him. I was literally about to say this! 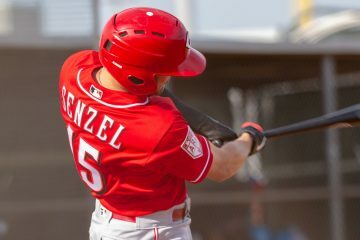 The big news is the fact the Reds are waking up to the idea of Senzel in CF. With Senzel in CF the Reds offense stands to be amongst the top of the league. Only question is how big will the defensive drop off be? Now that order may not be right depending on who’s pitching (lots of LHH), but man that is a lot of quality bats in there. Love the thought of a Winker, Votto, Suarez, Gennett, Senzel top 5! I just hope Winker and Senzel can come back healthy as ever. So with that in mind Peraza is a big part of this conversation, because Nick Senzel should be our SS. I see a lot of feelings going on so I’m going to explain this very clearly to everyone, not singling out you Doug or anyone. But if Nick Senzel can just play a bad SS and hit league average, and it would be stunning if that’s all he could do on either side of the ball, then he’s an upgrade over Jose Peraza, this shouldn’t even have been a debate. To disagree with this does not make sense. To agree with that does not make sense.. I agree with Stock are you completely off your rocker to think that Billy and his defense is even remotely close to Peraza. I mean dude Billy is seriously one of the worst if not the worst hitter in the entire MLB. His defense is great but it nowhere near makes up for his offense dude needs to be traded or non tendered like yesterday. Billy’s BSR has gone down each season for the past few years, while Peraza’s is actually improving. Billy is was 34/44 (77.27%) in SB attempts. Peraza was 23/29 (79.31). Take that as you will, I just wanted to provide some up to date info. I gotta say I’ve sadly given up fully on BHam’s offensive progression. And if Peraza is to be seen as a still developing player then I would point to his .347 OBP over his most recent 110 games — 50 points better than Hamilton’s career on base — and it came with a .453 SLG. The Reds will have to see how much of a drop off defensively Senzel is from Hamilton in CF, but I figure (Senzel + Peraza) > (Senzel + Hamilton) so I agree with Stock. I believe peraza is under club control for longer/cheaper as well? So I favor him. Hahahaha I actually agree with Doug. Helllllllooooooo if Senzel can play CF this is huge for this rebuild. BTW I don’t know why we wouldn’t think Senzel could play CF this entire time I mean we had Choo out there who looked slightly above if you put Adam Dunn in CF J/k. But seriously this is huge if Senzel plays CF. Not to drag it on, but part of the reluctance to accept Peraza as below average depends on whether or not you think he can avoid the slow start of 2018. I think his ops+ for the last 4 months was solidly over 100. I guess i’m slightly leaning towards him being more like the June to September version but he has improved and regressed before. At his age, I see him improving on that 97. I contend that Peraza is an above average hitter (for a ss anyway). On the other hand he’s a slightly below average batter, because he doesn’t walk as much. The average OPS for a ML starting ss is about .749, whereas Peraza had an OPS of .742 last season. Question is, can Peraza learn better plate disipline ? I think so, with maturity. He’s still young. The other question, is can Jose be an average SS? I would think his D is also below average. His defensive stats are all over the place. Per Fangraphs his defensive war is +3.2. That makes him above average. However, his UZR per 150 is -3.3. He is no Cozart but think he is better than Senzel would be at SS. What’s the benefit of making this distinction — hitter vs. batter? Drawing walks are as much a part of the game as hitting singles or any other outcome for a plate appearance. Perhaps in sabermetrics, but not in the real world. Being able to make contact is still an advantageous skill to have. Just for kicks, Suarez had 29 errors in 743 total chances while playing ss in 2014 & 2015. Peraza has had 29 errors in 872 TC while playing ss in 2016-2018. Not much better, but no worse than Suarez. Only 2019 will tell if Jose can substantially improve his defense enough to keep the ss job for the Reds. Regarding Peraza, he made strong, sustained improvement over the course of the year at the plate. His numbers from June through the end of the season were quite strong and would be above average (sOPS+ ranged from 107-131). The more traditional metrics are being weighed down over the course of the season by his abysmal May. As a young player, I think it is quite reasonable to evaluate Peraza’s future potential on his last 4 months where Peraza’s power began to play (12 of the HRs came in the last 4 months) and his batting average stayed above .288 for each month. I’m certainly hopeful that’s the version of Peraza we see in 2019. It’s why I used the phrasing that I did within the post, rather than demonstrably stated he was below-average (which, again, he actually was in 2018). Let’s forget about Peraza’s hitting for a moment. Someone in the Reds hierarchy said that Senzel is capable of playing CF. Is anyone excited about that? I am!! Yup, I think we can all agree on that one. Senzel for CF May 2019. My only concern is having a reputable backup because I will always see him as a guy who is going to have stints on the DL and never able to play more than 140 games a year. Hamilton might well be that back-up if they don’t move him. Phil Ervin and Schebler can also fill in at CF if need be. Maybe even Mason Williams? A couple of months ago I suggested Senzel to CF, citing the fact that half of the Reds games would be played in GABP, his youth, athleticism and baseball IQ. I also noted that Ian Happ is able to play a good CF, and wondered why no one in the Reds organization is able to think outside the box like that. As I recall, not one person on this message board agreed with me. But whatever, I just hope it happens. I still think they need a true CF on the bench, to take over late in games for defense with Senzel shifting to the infield. Hamilton would be the perfect guy for that, but his arbitration number is going to be way too high for a bench role. Siri needs to play every day so he’s out. The guy I’m thinking of is going to have to come from outside. If the Reds sign a guy like that sometime in the next few months then we’ll know Senzel is a legit contender for CF in 2019. What are you talking about? People here have been discussing alternative positions for Senzel since he was drafted but especially after Suarez was extended. Obviously SS and CF were on the top of the list based on the offensive numbers produced by the projected starters last spring. I seem to recall this as well. It’s long been discussed about Senzel trying out CF. Well that’s fair, I’m sure it has been discussed from time to time. But I was referring to the specific post I made, not every post ever made. That’s all. I’m guessing because it had been discussed at length. It wasn’t exactly covering virgin territory at that point. I can’t imagine a host of people disagreeing with the idea. This is not a message board. That’s helpful Doug. Thanks for clearing it up! You aren’t a message board! When the idea of Senzel to the OF was presented last spring Doug’s main objection was the vertigo. It was mentioned how impacts into a wall or while diving could jar loose the calcium carbonite crystals in the ear leading to more missed time with vertigo. Is this no longer a concern? The Reds never once brought that up. I, however, did. But if they are going to play him in the outfield, and they clearly are giving it a shot, then he needs to be in center if someone thinks he can actually play center. I don’t disagree. I just wandered what happened to that concern. If we can control and treat the problem I don’t think it matters where he plays. I found this interesting. I kinda thought that you were speculating, without much data, that there would be less diving and colliding in the infield than the outfield. He did, after all, get his last bout of vertigo after diving for a ball at third. I thought, also without any useful data, that the opposite was true. If a guy plays defense aggressively like Billy Hamilton or Ryan Freel, then he’s going to have collisions with the wall and the ground. If the player can dial it back, and realize that getting that extra out in a 6-1 game isn’t all that important, then he can avoid a lot of that. I would think that would be easier in the outfield than the infield, where the dives are more directly reactive to the batted ball. I think he should play wherever they need to play him (which to me has long been obvious as centerfield), and not let the vertigo play into the decision. The vertigo is what it is, and there probably isn’t much of a way to control it. One treatment for benign positional vertigo involves sitting on the edge of the bed and flopping backwards, shaking up the otoliths and letting them resettle. Maybe an occasional wall banging will help the vertigo! Senzel has to either play 2B, or CF. To good a defensive player to out in a corner OF spot. Also, Too good not to play anywhere. So Doug, if Senzel really can play CF (man this would solve a lot of our dilemmas), do you think they would keep him in AAA to start the season and start Ervin in CF for 3 weeks before calling him up for service time? All of this assuming they DFA\Trade Billy in the offseason. PS. Sorry I didn’t go on a super long rant about how Peraza is a right around league average hitter and stuck to the article content! It’s a no-brainer that you put Senzel in CF if he can play there. Move on from Hamilton and let Ervin and Williams be the RH/LH bench OF’ers. Both can back up CF if needed. I don’t know how or why people want to argue with facts. Peraza was below average as a hitter last season. By both metrics that measure overall offensive output (OPS+ and wRC+). He made strides with his bat and for a SS that is fine, especially if he bats lower in the order. Defense is the bigger area of improvement I’m looking at for him. I am excited beyond excited by the thought of Senzel in Center. You replace one of the worst hitters in baseball with someone who should be well above average. Add that bat to a seemingly solid lineup and you are putting pieces together that make me squint and say there is light at the end of the tunnel. Having said that it would be the Peyote I ingested for my vision quest so…. I’m of the mindset that Billy Hamilton is an ideal 5th OF. He’s getting expensive in arbitration now, and I see that the Reds could save money by trading/non-tendering him. Is there any scenario in which the Reds bring him back explicitly to be bench depth, and if so, how much would they pay to do that? The only scenario that seems remotely plausible to me would be if the Reds non-tender him, and he can’t find a taker in free agency. (I just can’t see that happening though, with what he would bring to the table for a contending team.) In that case, maybe the Reds would sign him back at a discount and play him as the 5th OF (or even as the starter until Senzel is called up). Ichiro only has a career 107 ops+. Does this mean he is only a slightly better than average hitter? Peraza doesn’t walk much so I get that gripe but he makes contact a lot and he gets hits a lot. He’s added power to his game this year that nobody thought he’d ever have. The kid can hit. I think it is just some bias against peraza for unknown reasons. Doug has never been high on peraza ever since the Reds traded for him. Yes, that’s exactly what Ichiro was, an above average hitter. His career BB% is 6% which is below average. His career ISO is .091 which is well below average. He had a really good hit tool but the rest of his offensive contributions at the plate lagged making him just above average overall. This is great news so… Why is he not our SS?? My takeaway is that this front office guy confirmed Senzel can play SS! He said there’s nowhere on the field he couldn’t play. What has always concerned me is that we’ll never know because the Reds front office always bows to veteran privilege on who ‘owns’ a spot (Schebler to LF, anyone?). So the question becomes who is the better SS, Senzel or Peraza? Who’s the better 3B, Senzel or Suarez? Who’s the better 2B, Gennett or Senzel? We’re trying to build the best team we can, not play musical chairs where Senzel plops down on the only chair left. I’m glad I’m not the only one who noticed this lol. They also confirmed he could catch and pitch if you want to use that logic. The term “in the field” has always disregarded pitchers and catchers, but point taken. I’ve mentioned it before though if he’s not athletic enough to play SS, as the Reds suggested, then he’s not athletic enough to play CF. As a lifelong infielder where athleticism seems to be the only question mark on the guy, he would make a much better SS than CF, no question. The absolute best news out of this is Doug might break the internet today, 57 comments already! Imagine them clicks!! How they say, good for business!! Yesterday I stated that Lillie would probably not even be added to the 40 man roster when required. I still believe this to be true. I know it is difficult to project the 2019 40 man roster let alone the 2021 40 man roster. However, by 2021 (and especially 2022) the Reds will have a lot of players who are better prospects than Lillie that need to be placed on the 40 man roster. Here are the players that are currently in front of him come 2021. Some players will be traded or let go because of 25 man roster limitation and option constraints. Some will not. Step 1. Players currently on the 40 man roster that will be elsewhere in 2021 or on the 25 man roster taking the place of someone I had stay (8 players). Brandon Dixon, Jose Lopez, Keury Mella, Wandy Peralta, Jose Reyes, Jackson Stephens, Blake Trahan and Mason Williams. Step 2. Players currently on the 40 man who will be ML free agents and I have not resigning. It sounds like the Reds management plan to resign Gennett but I feel they should trade him because of the lack of roster space and there is a very good replacement waiting behind him (6 Players). Hernandez, Hughes, Disco, Bailey, Hamilton and Gennett. Step 3. Players who should be on the team in 2021 unless traded or let go because of players in group 1 or 2 above. All these players will be under team control through the 2021 season at minimum (21 players 10 position players and 11 pitchers). Barnhart, Casali, Votto, Blandino, Suarez, Peraza, Schebler, Winker, Ervin, Aquino, Castillo, Cody Reed, Mahle, Romano, Stephenson, Sims, Izzy, Lorenzen, Finnegan, Brice and Garrett. Step 4. Minor league players who will be out of options in 2021 and must either be in the majors or released. Since Step 3 + Step 4 = 26 at least one of these players will be released. More if players included in step 5 or 6 are playing in the majors (5 Players). Shed Long, Jose Siri, Rainey, Herrera and Wisler. Step 5. Players in the minors who will need to be added to the 40 man roster and would be ahead of Lillie unless he improves quite a bit (20 players). Step 6. Players not currently on the 40 man roster and not required to but may be added because they are on the 25 man roster (2 players). Steps 3 + 4 + 5 = 46 which is 6 players more than allowed. However some will have to be reduced because 26 are in steps 3 or 4 and Senzel, Santillan, Trammell, Friedl and Gutierrez may very well be on the 25 man also. This also assumes that no players on the 60 day DL and that the Reds sign 0 FA. Even if he is added there is a very good chance he falls off in 2022 as the following players (I think, no research here) must be added (10 players). Greene, Garcia, Jeter Downs, Josiah Gray, Miguel Hernandez, Rylan Thomas, Claudio Finol, Cash Case, Willems and Drew Mount. This is why I think Lillie never makes the 40 man roster and on the chance he is it will be only for 1 year. That’s a lot of information there. Can’t disagree with it. I think sometimes in the lower minors, you throw as much stuff at a wall and see what sticks. If we are judging hitters solely off of ops+ then Ichiro is only slightly above average at 107 for his career. Disregarding total hits when talking about a player being a good hitter is about like Marty saying votto was not a good hitter a few years ago because his HR and RBI totals weren’t up. what was the league average in batting average this year? I bet it wasn’t close to the .288 peraza hit and he did it with what I’m assuming was a much higher than average amount of AB’s as well. Breaking news. 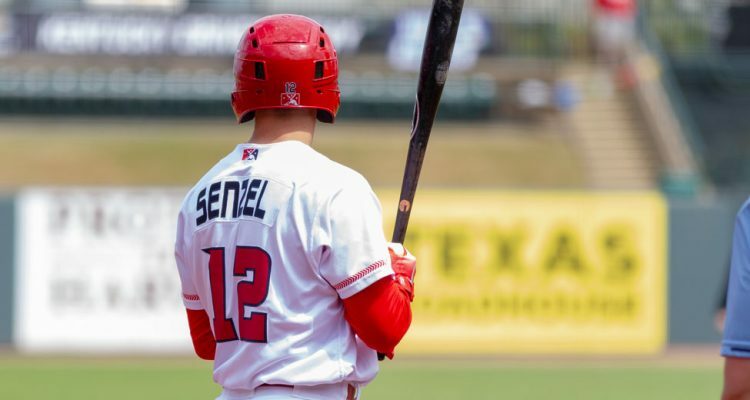 Senzel could play CF in 2019. I’ll believe when I see it. This is the dysfunctional Reds front office we are talking about. Senzel in CF makes much more sense than Senzel in LF, or even RF. It makes too much sense which is why Cincinnati will not do it. Also, this just in, Jose Peraza is an improving hitter. Call him below average or slightly above average or whatever, the fact is though that he is improving at the plate. That is good going forward. The defense, we can only hope it improves with better footwork, much like with Suarez before the 2018 season. I look for Suarez to regain his defensive chops in 2019. He had a lot going on in his life in 2018. He got a new contract and his wife had a baby girl. I am looking for better defense from the left side of the INF in 2019. Funny how Milwaukee is being credited as being built mostly through trades. So has Houston. The Cubs also. Reds don’t seem intent on following these 3 successful rebuild models. Reds trade candidates on the block should be Hunter Greene, Scooter Gennett, Billy Hamilton, Scott Schebler, David Hernandez, Dilson Herrera, and Robert Stephenson. Non-tender candidates are Brandon Finnegan, and possibly Hamilton. Well Senzel is out with bone spur surgery on his elbow. Looking like 6-8 weeks out. Yep. CF will have to wait until spring. Just unbelievable bad news. But it is in his non-throwing arm so that is the silver lining. My first thought all along has been to trade him for a controllable TOR pitcher, but even if some team would do that would Senzel ever be healthy enough to pass a physical?? But what top of rotation pitcher doesn’t also have an injury history? Scherzer? Even Sale now has some injury concerns. 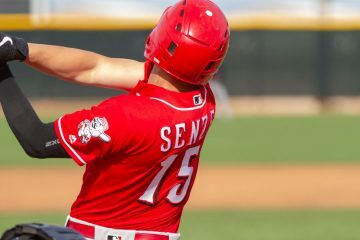 While I’m happy to see the Reds have at least tried Senzel in CF, I’ll believe they’ll play him there when he plays in more than one or two token games like he did at SS. Frankly, I think it’s a waste of his defense and despite all of the talk of Peraza’s hitting (I agree with FWIW), the Reds cannot go into next year with the same set of infielders. Purely from a defensive perspective. Average would be an improvement for any of them. Meanwhile, Senzel has always gotten rave reviews for defense all through the minors. Trade Gennett, put Senzel at 2nd. Finding an upgrade for Hamilton should be easy, since he’s terrible offensively and his defense is also slipping a bit. To compete eventually they will have to replace Peraza too, but he’s fine for next year. Hallelujah Hanawi! Finally someone who can see the obvious. Senzel will likely be more comfortable at send and has spent some time there. He will cost much less than Gennett – who I like – but we can’t spend 10M$ on a 2nd baseman as a small market team. Put that toward a pitcher, put Siri an Ervin in center and work work work to improve the starting pitching. Nick Senzel is injury prone. No two ways around it. He’s obviously very talented and a good player when healthy, but he’s not healthy enough. Not sure how much the Reds should count on him going into 2019. Senzel’s left elbow has been bothering him for 10 months, according to a quote from himself. Here’s a thought, why didn’t he have the elbow surgery while he was out for the finger surgery. Great planning. I am the 100th comment on this post. Today I learned that Jose Peraza is a slightly below average hitter. I also re-learned that Doug does not suffer fools lightly. Oh, and Nick can play CF. Copyright RedsMinorLeagues.com. All Rights Reserved. RedsMinorLeagues.com is an independent news source and is not affiliated with the Cincinnati Reds, Major League Baseball, any of the Cincinnati Reds minor league affiliates or Minor League Baseball.